Quirky Jessi: What do Snuggies, Slankets, Freedom Blankets and Blankoats all have in common? What do Snuggies, Slankets, Freedom Blankets and Blankoats all have in common? According to Gizmodo, it's their knack of for allowing enough space for maneuverability, unlike a regular blanket. When is this most important? While gaming, of course! You probably thought (or hoped) that I'd never post about these things again, but they're absolutely everywhere! 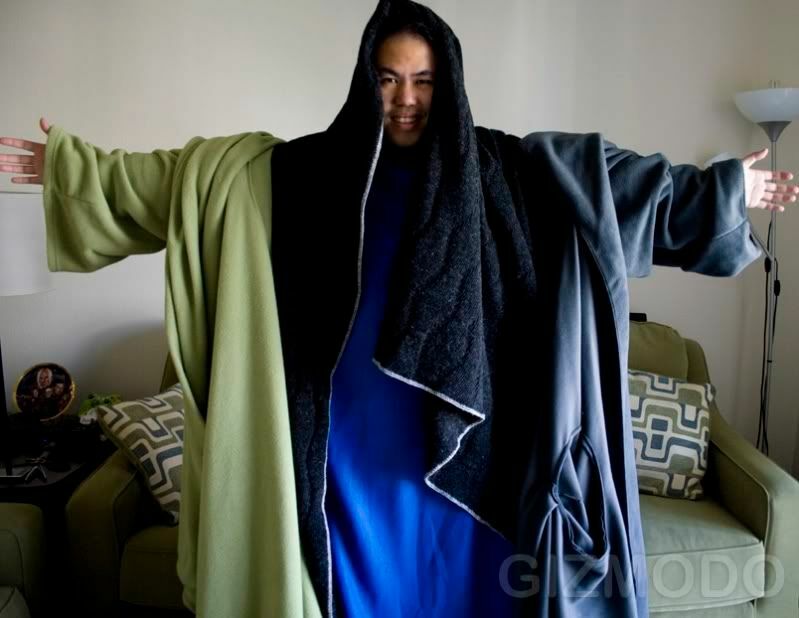 I don't personally own any Snuggies or their counterparts. I still think they're rather cult-like, too, both in appearance and attractiveness to the masses. :P In a few decades, there will be updated lists of the "You're a kid from the 80s if you remember....," and Snuggies will be on there for those from the 2000s. Geesh. If you're going to own one, though, you might as well make good use of it, and I can't think of a better time to wear one than while gaming. Keeps you warm and snuggly while your hands are left free, instead of tugging a blanket around all the time. In the market to buy one yourself? Check out this post first. He compares each one, leaving you with his opinions, price checks, and which ones are most comfy. Oh my!! That's pretty funny. I wonder how they do at keeping your back warm? LOL!! He used the blanket really very well. It seems like a royal attire. The best idea would be to call your credit card company. Tell them that the company would not let you cancel the order, & that their ordering procedure was confusing. You might have to wait until the product arrives, but your credit card company will work wtih you!